Today Disney has revealed new images and details on what to expect when the Skyliner begins operation in 2018. Here’s a quick glimpse at some of the artist renderings and details direct from Disney. From what Disney revealed today it doesn’t look like all cabins will feature Disney characters, just a handful that will be soaring around property. There is still no mention of air conditioning, we revealed that it was unlikely so it seems that this is still the case. Pop Century and the Art of Animation don’t have any images released, but Disney did have a few words to say about the design. 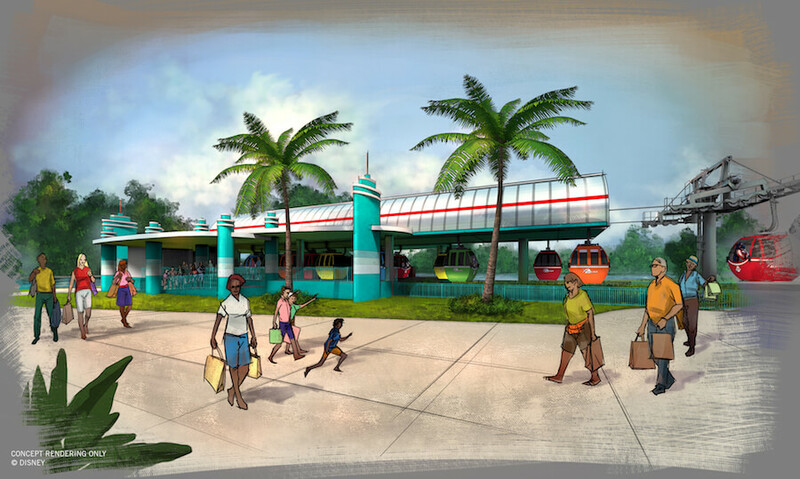 Disney also released an idea of what to expect when riding on the Skyliner gondolas. [The] cabins will slow down at the Disney Skyliner turn-station along Buena Vista Drive, where guests can see the mechanical and aerial components that make up the Disney Skyliner. So it looks like we’ll also get a glimpse of the ride system when the project becomes operational next year.